Posted on January 19, 2018 in Insights by Julia Zhou. 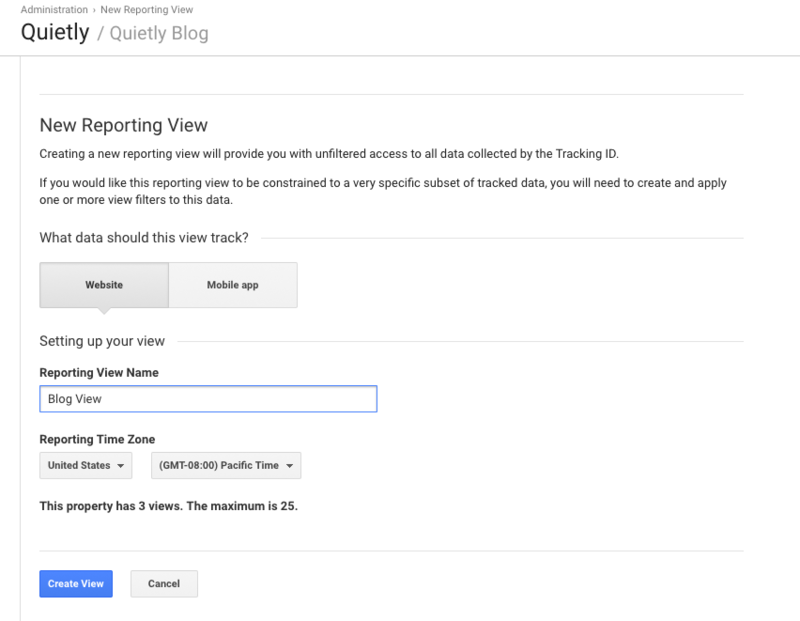 Do you have just one view set up for your Google Analytics account to see all of your website traffic? 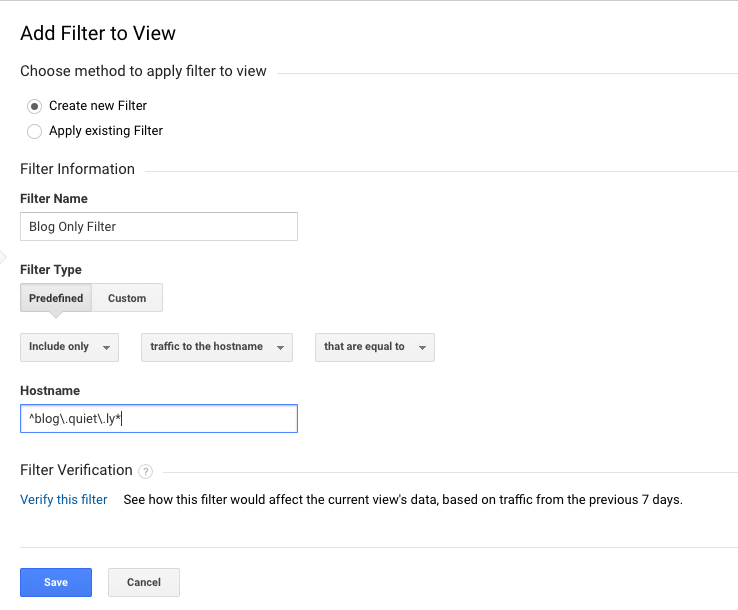 It’s a default setting that can lead to a lot of time spent filtering if you want to use your Google Analytics for content marketing. However, if you set your analytics account up properly the first time, this should all be a breeze. The best way to get valuable metrics on how your blog is performing is to set it up as a separate view. Here’s how (and why). Why Create a Blog-Only View? There are a few main reasons to have a blog-only view set up. Firstly, with a blog-only view, it’s much easier to find the metrics that are the most important for your blog. Separating your blog data from the rest of your data means you don’t have to comb and filter through all of your pages in Google Analytics just to find some specific information for your blog performance. Having a blog-only view also makes it easier to integrate third-party tools (such as Quietly Insights) for your content specific pages. Many third-party tools will look at just one specific view of your Google Analytics, and having a blog-only view allows these tools to hone in only on the data you need. It’s worth noting that when you create a blog-only view, you’re not completely separating your blog from the rest of the site, analytics-wise. You’ll still have a view with all the data in one place, in case you need to view everything together. Quietly Insights segments your data so you don’t have to. When you’re setting up Google Analytics for your site, it’s helpful if your website is well-organized. Specifically, hosting your blog on a subdomain (blog.example.com) or in a subfolder (example.com/blog) is ideal. Generally speaking, going the subfolder route is better for SEO—but ultimately, whatever makes the most sense for you and your team is the best approach. 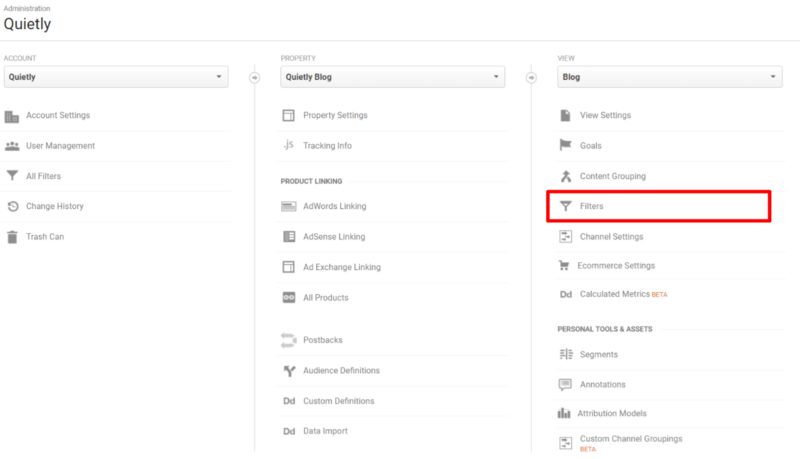 If your blog’s already set up on a subdomain or in a subfolder, then you’re ready to create a blog-only view in Google Analytics. Otherwise, talk to your site admin to consider switching to a more organized blog structure. Then, follow the steps below to set up your blog-only view. Logged in? Ready? Here are the steps you’ll need to follow. This is a raw view that includes all your traffic. You should always have a some type of master view (whether it’s called a “Master View” or an “All Website Data” view) with no filters as a backup in case something goes wrong. With a master view, you always have a copy of your site’s raw data to fall back on. If you already have a master view of some sort, skip to the next step. 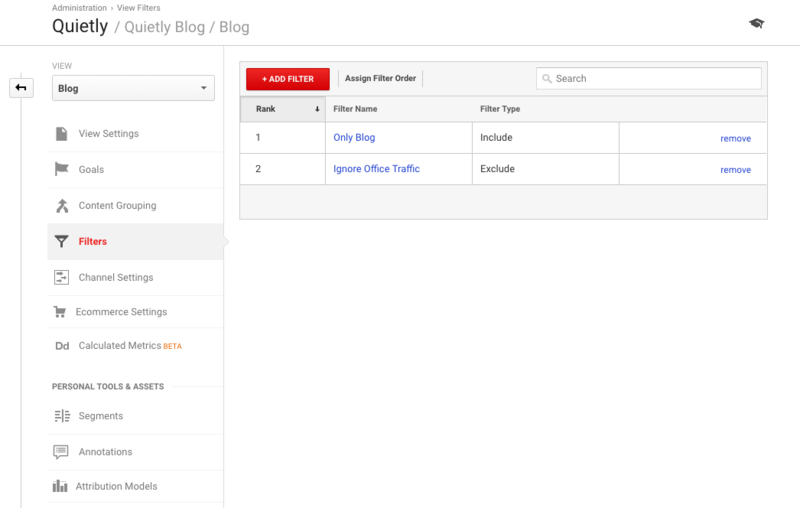 To create a master view, navigate to the “Admin” section and using the drop down menus, select the Google Analytics account and property you’d like to create a new view for. Next, click on the drop down menu under “View”, and select “Create new view”. Name your view “Master View”, “All Website Data” or something similarly descriptive. Now that you have a master view setup, you can set up a blog-only view. Keep in mind that any filters you apply to views at this point are permanent and non-reversible. 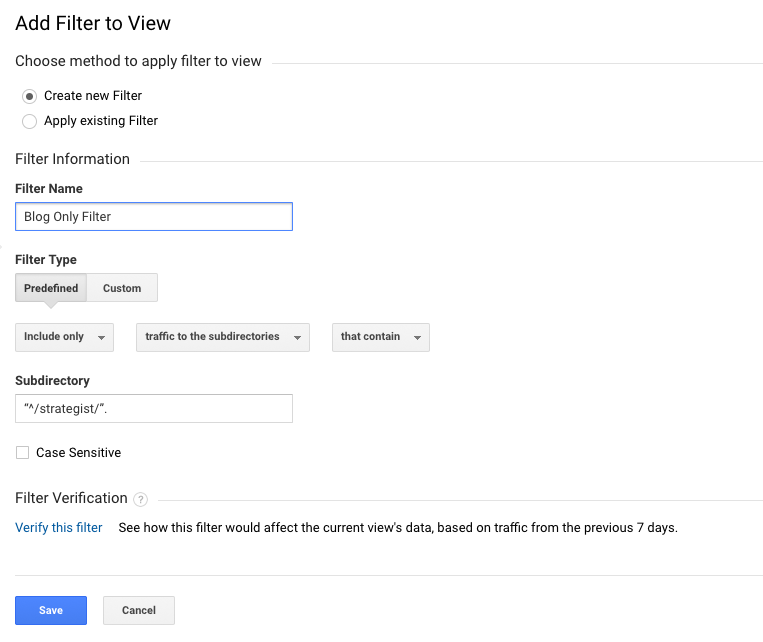 Filters tell Google Analytics not to collect specific types of data. This is different from the filters in your dashboard, which just hide some of your data. 2. Create a separate view for your blog. Add a name for your blog view (Such as “Your Website” Blog), select a time zone, and click “Create View”. Quick reminder that, at this point, if you don’t have a master view set up, it’s time to go back to step 1 and create one. Once you apply filters to a view in your data, there’s no going back. Once your view is created, make click the “Filters” option under your new view on the far right column. Click “+add filter”. If this option isn’t available to you, you’ll need to talk to your administrator to enable the option for you. Select the “predefined” filter tab. Choose “Include Only”, “traffic to the hostname”, and “that are equal to”. In the Hostname box, type in “^blog\.example\.com*”, but Replace “blog” with whatever your subdomain is, and replace “example.com” with whatever your domain is. Remember to keep the backslashes (“\”). Those are required for this expression to work (if you’re curious, learn more about regular expressions here). As an example, the expression our Quietly’s blog filter is “^blog\.quiet\.ly*”. Select the “custom” filter tab. Choose “Include Only”, “traffic to the subdirectories”, and “that contain”. In the Subdirectories text box, type “^/blog/” (without the quotation marks), and replace blog with the name of your subdirectory. For example, Herschel’s blog, (found at herschelsupply.co/blog/) would use the pattern “^/blog/”. Now that you’ve created a blog view in your Google Analytics, you’ll be able to find better blog insights quickly, and it will be more straightforward for you to use Google Analytics for content marketing purposes. Tools like Quietly Insights will have also have a much easier time reading and breaking down your data. 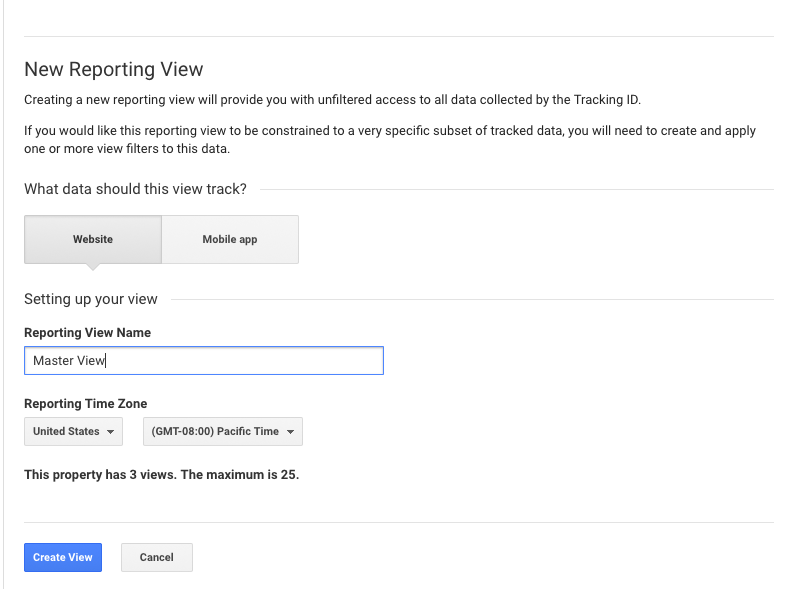 Need help with getting your Google Analytics views set up? Call in the pros at Quietly.